Download the project and media files to follow along with this project. First, Colin shows a reference from the work of legendary FX artist Douglass Trumbull. Colin lays out the goals of the tutorial and plans out the approach to replicate some of the look and feel from works Trumbull accomplished optically, such as a “slit/scan” setup, the “Jupiter Machine”, and the solarization effects found in the Stargate sequence of 2001: A Space Odyssey. Colin also shares resources for open source space imagery from the Hubble Space Telescope, and additionally the Juno space explorer, which has very recently taken eye-popping, high resolution photos of Jupiter. Colin opens up VDMX and demos a controllable and live Stargate file. After walking through the basic structure, he starts from scratch on the build. First order is to get the heart of the graphics working with the combination of two FX: The turbulence and scroll properties found in the BadTV FX in addition to the circle wrapping (sometimes known as rect-to-polar conversion) found in the Circle Wrap Distortion FX. These two effects when combined make the core of the Stargate. Colin then breaks down the power of using layers as a source in VDMX, a key concept. He uses these techniques to create a patch for the stargate, and shows how two layers can work together to build a mask. He uses shape masks and layer masks to get control of his making operations. He also creates a single slider control to drive similar properties so that the stargate can be animatable and controllable. In part 2, it’s time to make the stargate look epic. Colin shows how layers can be grouped together, and also shows some useful techniques with regards to blend modes that are needed to maintain consistent behavior in the alpha channels when grouping. Once that’s done, he adds a background. Next up is the radiating energy effect, which is accomplished with the ghosting FX and a clever use of masking. LFOs drive the oscillating motion of the ghosts. Next, to create the flares, Colin reaches for Circle Splash Distortion, which can create results similar to a slit scan setup. He modifies the streaks property and adds the Color Levels effect to create multi-colored flares. He also is sure to tie all of the new layers and FX to a single control slider. Next, to soften the look, RGB Trails 3.0 is added along with a Twist and a Shockwave Pulse, to really sell the look of a high energy source. The final step covered in the build is to add some displacement. Custom ISF shader files are used to generate a fractal Brownian motion noise. In addition to the ISF generator, an ISF FX file is used to displace all of space with the noise. Colin briefly talks about the resources he used to create/modify the ISF generators and FX, and shows how you can get them working inside VDMX. Finally, Colin returns to the demo file, where he explores variations and different looks for the stargate, particularly the FX found in the distort category. He shows briefly how he set up an animation trigger to reveal the stargate on cue. After completing this tutorial, you might want to head over to the NASA Juno site or Hubble Space Telescope site to grab your own space imagery and feed it into the stargate and see what other kinds of looks you can achieve. Be sure to check out what else ISF can do and how you can use it in your projects, get familiar with masks in your projects, or learn more about visual FX. Download the example project and media for this tutorial. Seed the Stargate with different sources for unique results. Explore variations with visual FX. 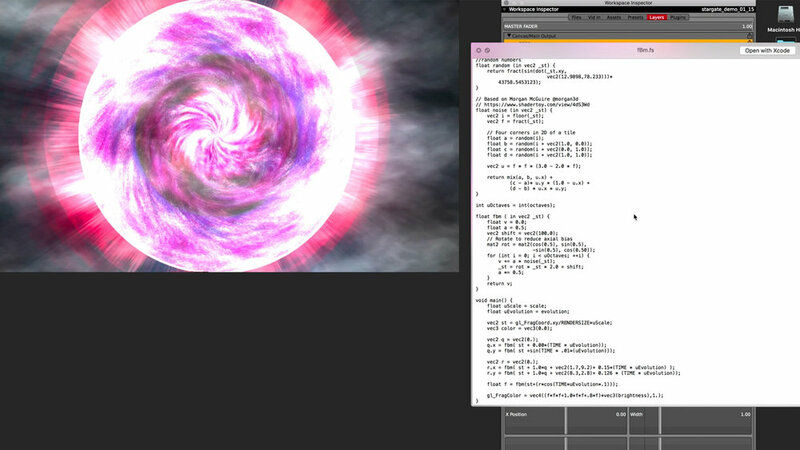 Use ISF generators and FX to create a space like atmosphere.